The 2018 World Football Summit which was held in Madrid, the Spanish capital between the 24th and 25th of September 2018 climaxed with Football Legend and new owner of Valladolid Ronaldo da Lima giving an insight on his new club acquisition, future plans for the club and the round leather game in general. Top on the menu at the summit were Football business, how it could influence the economy, enlightenment for football supporters across the globe among others. Even though keynote address speaker Philipp Radel admitted that "It is sometimes for the federations difficult to adapt themselves to the current market and push the sports industry, but he made it known that it is imperative to join the moving force". Another speaker Enrique Arribas said "The best thing about football is its capacity to impact positively to the society". The development of the game globally was brought to the fore with a conviction that Football development has to be continuous. 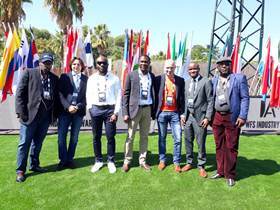 Members of the Football Intermediaries Association Of Nigeria FIAN, been the recognized Nigerian intermediary team were present at the global summit. The members of FIAN present were Chima Michael, Bright Ifeanyi George, Taiwo Oyeyemi Joshua, Fowakan Adewale and Johnny Ogbah. Others are Mr Leslie, Benjamin Ashaka and Endurance Iseri Ogbemudia. Speaking of their experience in Madrid, Endurance Iseri Ogbemudia said the football industry in Nigeria is untapped, and Football Administrators must put on their thinking cap. He Cited an instance where one of the speakers at the WFS from the MLS said their league doesn't get any income from TV rights, that funding of the League and it's club is from tickets and corporate sponsorship which in comparison with most NPFL clubs who rely majorly on funds from the LMC and can't account for gate takings and the incessant issues of players/coaches indebtedness. Ogbemudia further appreciated God Almighty for the experience and the organizers of the World Football Summit because it gave him and other members of FIAN who attended the summit opportunity to network with football stakeholders from different parts of the World.